The first thing you would notice is that there’s no key. Actually, the car has a key hidden flush in the fob, but you don’t need it to start the car. Simply press the On/Off button while depressing the brake (with the key fob within the car’s cabin, of course) and the engine roars to life. Your pleasurable driving experience starts here, and you would likely not want your journey to end given the creature comforts the car offers. The 2.5-liter V6 engine seems properly matched with the midsize executive sedan, providing enough power when needed, yet a smooth ride when you’re just plying city streets. The Teana’s Xtronic CVT (continuous variable transmission) feels like an upgrade from most old-school CVTs that don’t deliver enough oomph when called for. A steady right foot gives you smooth acceleration with no shift shock at all. But floor the pedal on those uphill terrains or when overtaking and the CVT downshifts to give you that much-needed acceleration just when you want it. Most other reviewers would take cars to the expressway to test the car’s performance on the straightways, but my family and I decided to take the car for a spin around our hilly hometown of Antipolo to see how the car fares when driving through the hilly and winding roads of Sumulong highway. 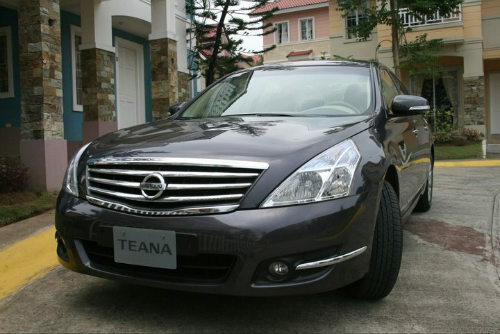 The Teana doesn’t break a sweat, even when overtaking those hunkering, overloaded trucks going uphill, nor does it lose control when negotiating the curves and banks when going downhill past the Padi’s Point and MMLLDC areas. 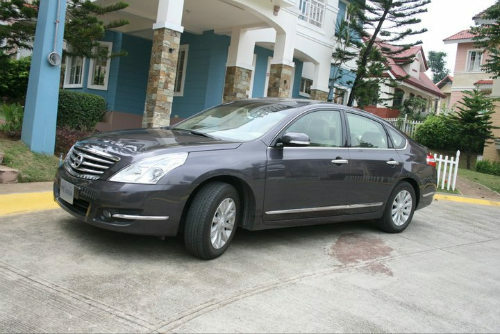 The Teana’s suspension is soft enough to go through Quezon City potholes without as much as a shudder, but stable enough when cornering at relatively high speeds. At some points, though, you’d want to toggle the Sport mode to ensure the CVT doesn’t upshift prematurely when going through steep inclines. I wonder how performance would be with the 3.5-liter V6 variant reviewed by my fellow tech blogger/motoring journalist Abe Olandres. 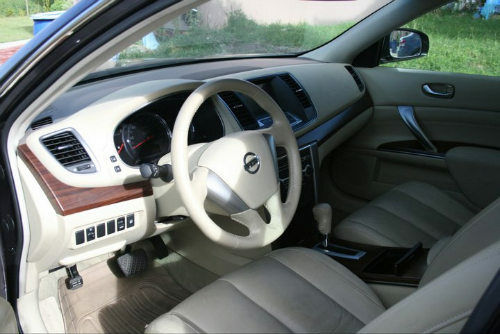 Being targeted at the luxury/executive market, the Nissan Teana comes with creature comforts up to the tiniest nook and cranny of the car. Of course, there’s the legendary Nissan air conditioning performance. 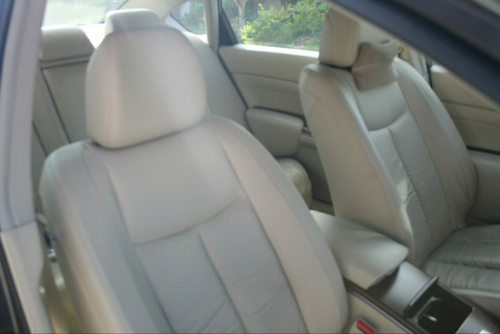 Even without window tints, the A/C can handle hot summer days adequately (I was told these cars had UV-treated windows, so the only reason you would want tints is for privacy). The A/C can either be set to automatic climate control or manually controlled via temperature-specific thermostat. 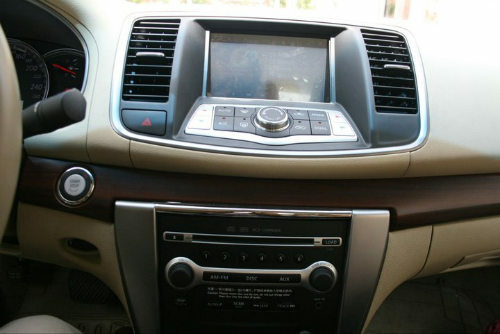 The Teana also comes with various multimedia features that an audiophile/videophile would find exciting. On the dashboard is a 7-inch resistive LCD that displays all sorts of information, including radio station and settings, air conditioner status and settings, and the like. Open the glove compartment and you’ll find several interfaces: SD slot, three USB ports, and an iPod connector. Plug in your iPod and you can control it via the touchscreen. Plug in a USB card and you can play the songs or movies inside. Insert a DVD and you can watch movies while on the road. Did I mention the 2DIN integrated head unit comes with a slot-loading 6-CD changer? And a pleasant surprise: shift to reverse and the LCD screen displays the car’s view from the rear bumper, complete with distance indicator lines. This is great for parking a car this long in confined parking spaces. 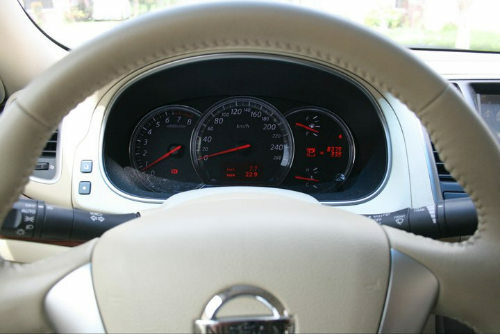 The Teana we reviewed also came with (optional) GPS navigation system, which works through touch screen. Fond of making calls while on the road? You can pair your mobile phone via Bluetooth, and audio comes out through the car’s speakers. Aside from the gizmos and gadgets, of course, is the car’s passenger comfort. 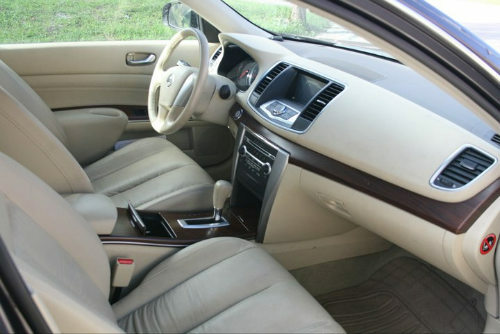 Soft and supple leather seats cradle your body like an easy chair you’d want to sleep the moment you enter the car. Even the center console/armrest is leather-covered. If you’re fond of drive-thrus (like my family), you get four cupholders–two on the center console and two on the foldable rear center armrests. 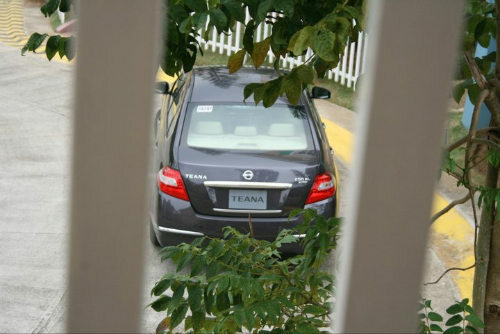 The Nissan Teana’s main competitors are the Toyota Camry and Honda Accord. That’s certainly stiff competition, given the reliability and popularity of those marques. 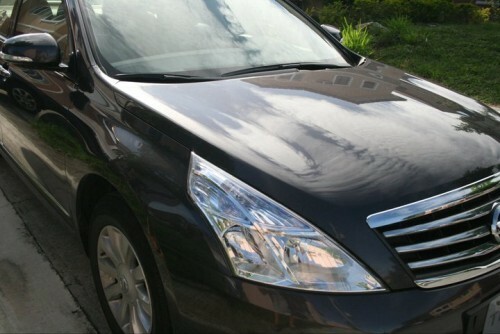 Priced in the same range as comparable Camry and Accord models, the Teana can compete with its proven Nissan comfort, and the fact that you won’t be like the average CEO or company president with their Camrys and Accords. And with this particular model, Nissan can compete on price. 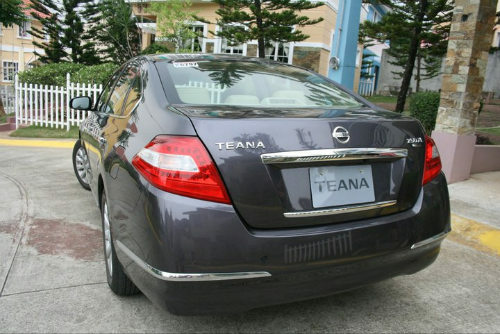 As I earlier said, the Teana is a head-turner. Even though it’s not necessarily the most expensive luxury/executive sedan around, it certainly looks and feels that way. In the end, it’s the review car that my wife, kids and I will miss the most. We got an updated price figure from Nissan Philippines. 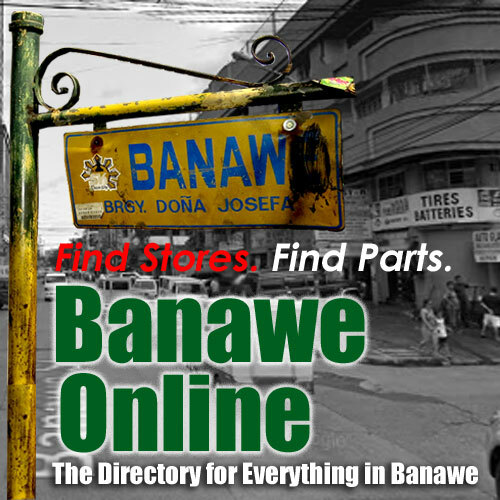 It seems this particular variant is priced at about PhP 1.7M and not PhP 2M as earlier quoted. Dual airbags, ABS, EBD, seatbelt pre-tensioners, brake assist. Cream-colored interior is a dirt magnet! FWD. This can either be a pro or con, depending on how you look at it. Fuel economy is not really a strong point of a car this size, as expected. We tested about 6 Km/L city and 10-11 Km/L highway. Great blog so i want to share here that How to Properly Repair Chips and Deep Scratches on Your Car? Using a cloth terry towel apply a small amount of scratch remover or cleaner wax. or scratch and buff when dry. If this removes the chip or scratch after a couple of applications, great, then just follow with a good wax or polish.